Ty Smith has been drawing the eyes of scouts for years. 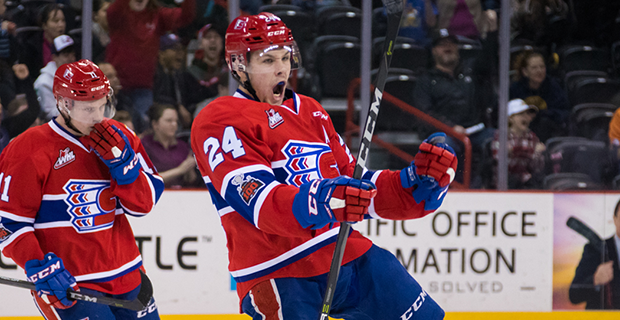 The 18-year-old Spokane Chiefs defenceman worked his way onto the hockey radar as a bantam in Lloydminster before playing a year with Delta Prep Academy and going first overall in the 2015 Western Hockey League bantam draft. Now coming off a stellar sophomore year with the Chiefs, Smith is pegged as the Dub’s top prospect entering this month’s NHL Entry Draft in Dallas. International Scouting Services lists Smith at 19th overall among skaters heading into the big day on June 22, but the 5-foot-10, 176-pound blueliner could hear his name called earlier given his developmental track record and dynamic two-way abilities. Smith made his name known in major junior hockey circles as a 13-year-old with the Alberta Major Bantam Hockey League’s Lloydminster Heat. A year before even being eligible in the WHL draft, the Lloydminster product racked up a staggering 60 points in 33 games to lead all AMBHL defenceman in scoring and claim rookie of the year honours. The left-handed blueliner took his game to British Columbia the following year to compete with Delta Hockey Academy in the Canadian Sport School Bantam Hockey League and managed to keep the same point-per-game pace with 28 in 16 contests before leading the class of 2015 as the top pick in the WHL draft. That same year, Smith was named the HockeyNow Minor Hockey Player of the Year for Alberta. Smith returned to Lloydminster to play out his midget season — jumping up with the Chiefs as an affiliate for two games and logging two assists in his WHL debut — before cracking Spokane’s full-time roster as a 16-year-old last year. After putting up five goals and 27 assists in 66 games as a rookie, Smith stepped into his own as a sophomore and maintained his first-round status by more than doubling the previous year’s numbers. Smith kicked off the season on a frenetic pace, logging a goal and two assists in a 4-2 win over the Prince George Cougars to start the year before adding six more points over the next four games. He went on to finish the season with 14 goals and 59 assists for 73 points while putting together 20 multiple-point performances — including a seven-point night against Prince George on Feb. 23 — and earning a place on the WHL’s Western Conference first all-star team as a 17-year-old. Smith has always been an offensive force, but this year he managed to grow his defensive game in Spokane as well. On top of dwarfing his rookie numbers this season, Smith flipped a minus-12 rating to a plus-44 as a sophomore before adding seven points and a plus-five rating in his team’s seven-game Western Conference quarterfinal loss to the Portland Winterhawks. Watch for a team like the Edmonton Oilers — who hold the 10th pick and are in a market for a puck-moving defenceman that can join the rush — to take a chance on Smith when they take the stage on June 22. The big-bodied Russian blueliner immediately became a key figure in the Red Deer Rebels franchise after joining the team in the 2016 Canadian Hockey League Import Draft. Alexeyev made the trip across the Atlantic in his quest to reach the NHL, and that journey will likely end late in the first round. The 6-foot-3, 200-pound defenceman led the Rebels defensive corps in scoring with seven goals and 30 assists this season and will enter the draft ranked 24th among skaters by ISS. The Lethbridge Hurricanes defenceman may be one of the smaller blueliners available at this year’s NHL draft, but what the Brandon, Man. product lacks in size, he makes up for in finesse and awareness. Known for his strong skating and finesse with the puck, the 5-foot-10, 180-pound blueliner has proven himself as a top tier WHL rearguard while earning a No. 48 ranking among skaters by ISS after finishing the season just shy of the point-per-game mark with 65 in 68 contests. The Everett Silvertips power forward had a slow start to the season but shot back up the ISS rankings into 51st among skaters thanks to a standout playoff performance. After logging 25 goals and 28 assists for 53 points in 68 regular season contests, the 6-foot-3, 200-pound centre went on to produce nine goals and 10 assists in 21 playoff games while helping lead his Silvertips to Game 6 of the WHL final. The Brandon Wheat Kings defenceman boasts excellent skating skills with an impressive 200-foot game. After starting his season in Moose Jaw, Burzan was shipped to Manitoba at the trade deadline in the blockbuster deal that sent Kale Clague to the Warriors. The 6-foot 180-pound defenceman went on to finish his season with 40 points in 72 games — 21 of which came in 30 contests with the Wheaties — to earn a ranking of 58th among skaters by ISS.